Become a sponsor or donate to help achieve our goals. 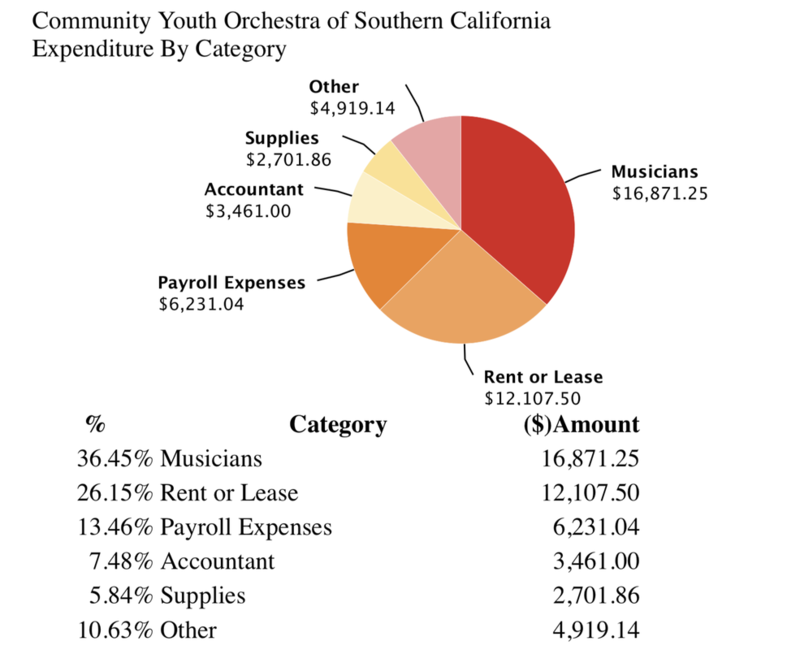 In the orchestra's past history, majority of our budget went directly to pay for the staff to maintain high student-to-teacher ratio in each groups. With the help of many volunteer staff (including our music director), some of our teaching staff doubling as an administrative staff (we have not hired a separate administrative staff or a web manager), and the Board of Directors comprised of our parent volunteers taking care of many essentials for the organization, have been able to keep our annual tuition at $400 per student. Over the last decade, the organization has grown very rapidly (from 40 students to 130 students, with only 2 groups to 4 groups). However, we were not the only ones growing - City of Irvine has grown as well, which meant we now had the added cost of facility expense (rehearsal and concert spaces). Also, as our organization got bigger, we have experienced some increase in other expenses as well.